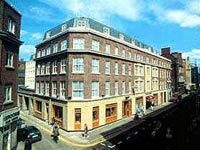 The Temple Bar Hotel is a popular hotel located in Dublin’s Temple Bar area. Close to all amenities making it the perfect base to explore all that our capital city has to offer. Dublin has a colourful history both literary and historical. The staff are pride themselves on their high standards and attention to detail and will do everything possible to ensure that the guest enjoys a memorable visit to Dublin. The Temple Bar hotel offers 129 standard en suite bedrooms with a choice of room type to suit all requirements and some rooms are adapted for people with special needs. Facilities include flat screen TV, Wi-Fi capabilities, direct dial telephones, tea and coffee making facilities and trouser presses. There is also porterage, room service, laundry and dry cleaning, baby sitting, luggage storage, assistance with travel arrangements and business and secretarial service. The hotel offers five meeting suits containing up to the minute facilities. The Terrace Restaurant with its distinctive conservatory style serves a full Irish and Continental breakfast, and offers a changing selection of table d’hote menus in the evening. There is a comprehensive wine list to make your meal complete. Buskers Bar with its big screens, and all day food makes an ideal venue to watch a match, have an informal lunch, a light snack or a coffee with friends. Buskers offer a wide range of finger food menus. The newly renovated lobby is ideal for a casual get together, an informal business meeting, a pint of the black stuff or an excellent cup of coffee in a lovely friendly atmosphere, The Lobby menu offers a range of beautiful panninis, gourmet sandwiches, and pastries. The Rendezvous bar is a traditional residents bar and lounge area, with access only from the lobby. Temple Bar is the hottest spot in town with beautiful cobblestone streets and a laid back bohemian atmosphere. The hotel is close to Grafton Street, Trinity College, The Natural History Museum, The National Gallery, Dail Eireann and Dublin Castle. The guest will return home with a great sense of Dublin’s culture and history.